This collection of Frisbee games are easy and fun to play. If you can throw a frisbee, you can play these games. If you can't throw a frisbee, don't be discouraged, I have included some simple instructions. 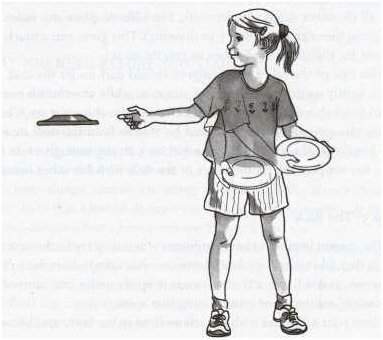 If you want to play frisbee games with children, you may want to review the basics of the art of frisbee throwing and the instructions below are simple enough for them to understand as well. Stand sideways to the direction that you want the frisbee to go. (Use your shoulder as a pointer.) Your feet should be about shoulder width apart, your knees slightly bent and most of your weight on the back foot. Hold the Frisbee along the edge that is facing the target. (That edge is called the leading edge.) Place your thumb on the top of the frisbee, your index finger along the edge and your other fingers underneath it. Your hold should be relaxed and the wrist should be loose. Stand with your elbow close to your body and your wrist bent inward so the side you are grasping is farthest away from you. It should almost touch your belly button and your hand and arm should be wrapped around the disk. The far edge that you are holding should be a couple of inches lower than the nearest edge so that the frisbee is tilted down and away from you. Practice a few times moving the wrist forward and backward keeping the frisbee on the same level. The forearm should move just a bit and the elbow should stay close to your body. With a smooth and speedy movement, flick your wrist forward and release the frisbee continuing to keep the outside edge tilted down. The job of the flick is to create spin not cause the frisbee to travel far so at this point it will not travel far. Now that you've figured out the spin, you can add some distance. When you flick the wrist, transfer your weight onto the front foot and you can take a small step toward your target. Don't make a big sweeping motion with your arm. The power is from the legs and the body, not the arm.